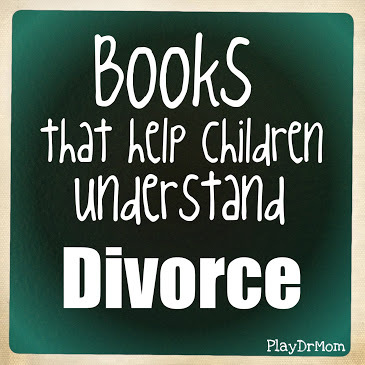 Here’s a list of books for kids about divorce. I use these in play therapy and recommend them to parents when the family is going through a divorce. If you have some to add, please leave a comment below! 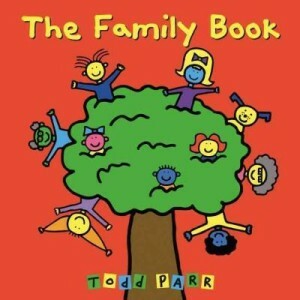 The Family Book, by Todd Parr … a great way to begin the discussion that there are many different types of families. 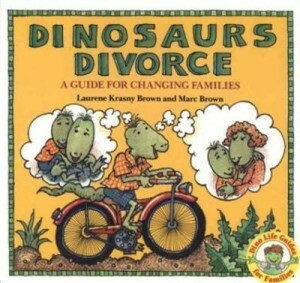 Dinosaurs Divorce, by Laurene Krasny Brown & Marc Brown … this is always my “go-to” book when discussing divorce with kids. It’s kinda lengthy, but use it as a resource books to talk about different aspects of divorce as they come up. The “D” Word, by Julia Cook … At first Otis can’t even say the D word, but then he learns the 3 C’s of divorce (he didn’t Cause it, he can’t Control it, and he will learn to Cope with it). 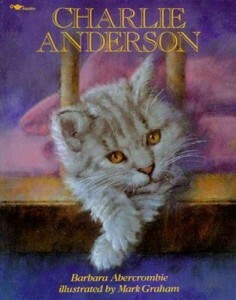 Charlie Anderson, by Barbara Abercrombie … a wonderful story about two sisters, a cat, and discovering that having 2 homes isn’t necessarily a bad thing. 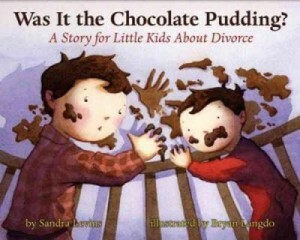 Was it the Chocolate Pudding? A Story about Divorce for Little Kids, by Sandra Levins … highly recommended book that stresses divorce is NOT the children’s fault. 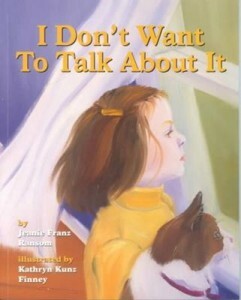 I Don’t Want to Talk About It, by Jeanie Franz Ransom … a picture book that describes many emotions that a young girl feels when she finds out about her parents’ divorce. 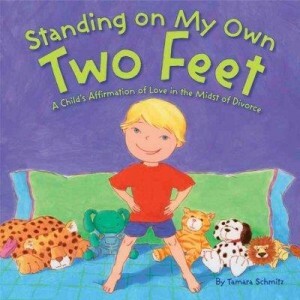 Standing on My Own Two Feet, by Tamara Schmitz … focuses on the unconditional love the remains for the child. 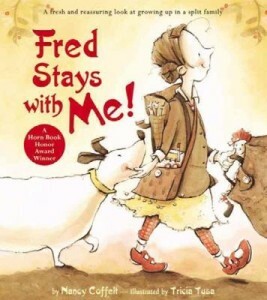 Fred Stays with Me, by Nancy Coffelt and Tricia Tusa … the book discusses divorce from a child’s point of view. 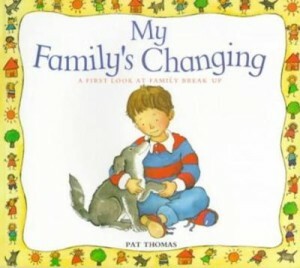 My Family’s Changing, by Pat Thomas … written by a psychotherapist to help explain divorce to preschool aged children. 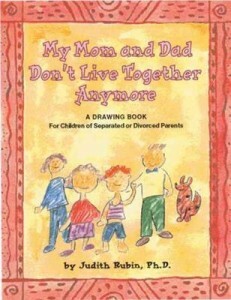 My Mom and Dad Don’t Live Together Anymore, by Judith Rubin … an interactive drawing book to help children ages 5-10, express and sort out their feelings after parents separate or get divorced. 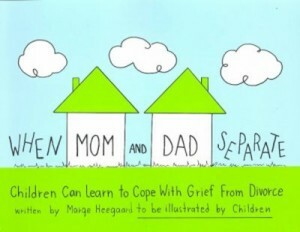 When Mom and Dad Separate, by Marge Heegaard … a workbook for kids to help them sort out their feelings regarding the divorce. My Parents are Divorced, My Elbows Have Nicknames, and Other Facts about Me, by Bill Cochran … a lighthearted book about having divorced parents doesn’t make you weird. What Can I Do?, by Danielle Lowry … illustrates the cycle kids go through when their parents divorce. When Mom and Dad Divorce, by Emily Menendez-Aponte … a spiritually based book to help kids with the conflicting emotions they may feeling when their parents get divorced. Goodnight, Daddy, by Angela Seward … this is not for typical divorce situations, but geared toward helping a child deal with having an absent parent. Mom and Dad Glue, by Kes Gray … a great book to help kids understand that divorce isn’t their fault. Best of Both Nests, by Jane Clarke … a little bird comes to terms of living in 2 separate nests. Two Homes, by Claire Masurel … a simple book for young kids about how there will be difference in both homes, but in each they will be loved. Divorce is Not the End of the World: Zoe’s and Evan’s Coping Guide for Kids, by Zoe and Evan Stern … written by a brother and sister, this book is geared toward kids aged 8 and up to help them navigate the changes a divorce brings. A Smart Girl’s Guide to Her Parent’s Divorce: How to Land on Your Feet When Your World Turns Upside Down (American Girl), by Nancy Holyoke … Geared for girls nine and older, the book covers varies aspects of divorce. It’s Not Your Fault, KoKo Bear, by Vicki Lansky … simple book for parents to read to younger children about the subject of divorce. So many children have to deal with divorce! This is such a great resource list. Laura, these are great book suggestions and thank you for sharing them with your readers. We’ll be sure to share these with our circle of friends too. Great post! Thank you for your comment! I hope they can be helpful for those you serve as well! Thank you! And thanks for this great resource you provide. Sure thing, Carol. I will definitely check your book out. Thanks so much for commenting! My book below was recently published. MOM, DAD, AND EVERYONE ELSE is picture book about divorce. Instead of focusing on the sadness of divorce, it concentrates on the potential positive outcomes such as new and exciting experiences and people in the child’s life. I truly believe it fills a gap in children’s literature about the subject that better reflects my own experiences. I hope this helps anyone in need!